In energy storage today, it often seems there are the Lithium-ion (aka mainstream) guys and, well, everybody else. Battery technology and chemistry has evolved a LOT over the last decade, but what we still hear in the media is the Gigafactory, the latest iPhoneX or Pixel 2 battery life numbers, and eventual repurposing of electric car batteries (still mostly Li-Ion) to provide backup power for Residential needs. For those in our industry, renewable energy that is, who are dealing in non-Lithium chemistries, it can often be a battle of wits just to get beyond the "why not Lithium" conversation to engage in a deeper dialogue around the various technologies available, and salient benefits for specific applications. While it can be argued that energy storage is well past the "tipping point", according to experts at last week's GridWise Alliance GridCONNEXT conference, it is not yet clear who is winning the race to provide storage to back up our national and global conversion to renewable (largely intermittent) power. If you're still yet a virgin to the topic, Barry Ritzholtz provides a good overview of what he calls "The Future of Battery Technology", in a 5-part series he released on his blog earlier this year. Towards the end of the infographic is a blurb on Vanadium-Flow, generally introducing the topic of flow batteries - today you'll hear much more on an alternative type of flow chemistry, but we'll save that for the episode. Another excellent resource, as usual, is the Rocky Mountain Institute, which in 2015 published a white paper on The Economics of Battery Energy Storage that at 41 pages is a rather digestable introduction to what today's podcast guest spends most of his time thinking about - namely, "How multi-use, customer-sited batteries deliver the most services and value to customers and the Grid." We actually discuss some of the topics of the paper in today's conversation, in particular, there is a reference to the Wheel of Revenues you see here. 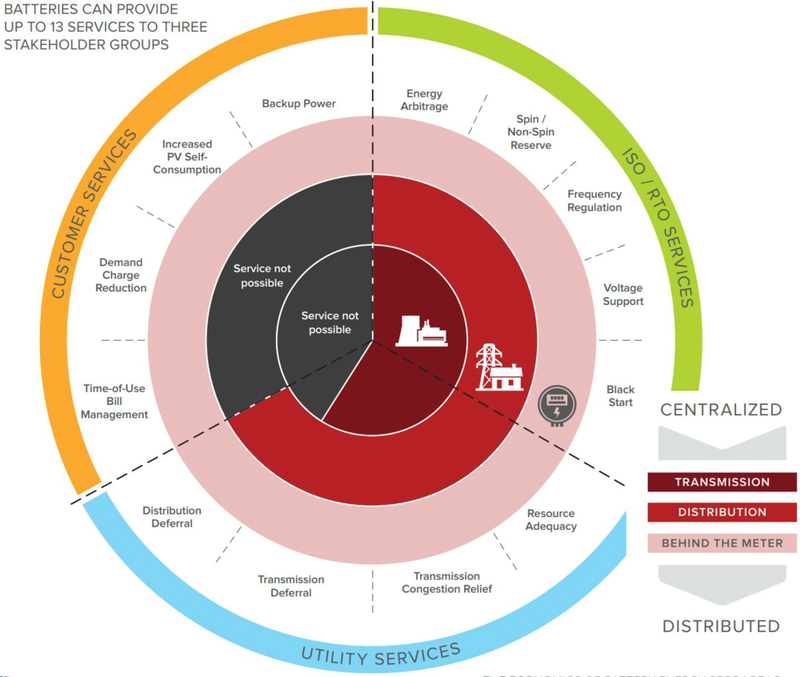 It is interesting to consider not just what types of battery storage are needed, but where each is best serving the overall goals of our energy transformation and grid infrastructure. In this, Episode 59 of SunCast, we are going to explore a bit deeper the shift in energy storage, through the lens of an underdog - someone Not directly tied to the assumed success of Lithium-ion batteries. Today on SunCast, I get to interview one of the guys who's had a massive impact on my own personal career, Mike Grunow, the VP of Marketing at Vizn Energy Systems. But he and I have known each other now for almost a decade. He was my boss at Trina, but he's been a mentor and friend since way back when he was in GE, and today, we really dig in and hear Mike's perspective on the storage landscape. Mike is one of the smartest sales & marketing professionals I know in the industry. I consider Mike one of my go-to experts when I need to really get a level-set on the value proposition of selling either a specific product or into a particular market, vertical, etc. His years at GE, Trina Solar and numerous startups have honed his ability to craft the story and understand all the variables for product introduction. And after all, just about any deal is the art of product introduction. But Mike is more than a marketing genius. He's completely consumed with and dedicated to the idea of moving our world towards a carbon-free grid. And I believe you are going to love hearing the passion in today's show. And, as promised, Mike also made reference to one of my favorite SNL skits of all-time - Happy Fun Ball - as a way to remind us that what you see in a proposal for storage may not be precisely what it appears to be on the surface, so be sure to check the fine print! If you enjoy this week’s episode of SunCast, please SHARE it and Subscribe to the show and newsletter for more like this!